We’re building a list of journals related to Service Design, Social Innovation and Customer Experience. If you know of a relevant journal let us know and we’ll add it to this list. Touchpoint, the Journal of Service Design, was launched in May 2009 and is the first journal on service design worldwide. It is published by Service Design Network three times per year and provides a written record of the ongoing discussions of the service design community. It aims at facilitating a forum to debate, share, advance, and codify the field of service design and its practices. Furthermore it wants to inform and engage clients that can listen in to the discussion, learn about the field, and become involved in the development and implementation of service design for their organisations. Each issue focuses on one topic and features news and trends, interviews, insightful discussions and case studies. 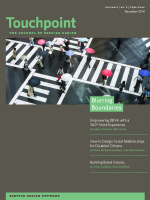 All issues of Touchpoint are available on the SDN website as both hard copies and downloadable single articles. In 1980, Lucius Burkhardt, the German sociologist and design dean in Weimar, published the essay “Design is Invisible” (Burkhardt, 1995). Relating his own research to Christoph Alexander’s Pattern Language, he concluded that the main focus of design should not be materialization but rather the value of solutions. This was one of the first manifestations of a shift in design taking place over the last few decades. As a matter of fact, we can observe two such major shifts in the design world. In the traditional world of product design, we can observe a shift from design being seen and used as styling via design as a process, towards design as a strategy. Companies have discovered that design is a crucial ingredient for innovation processes and that it needs to be anchored on a strategic business level. Design is invisible. It is about integrating the design approach deeply within organizations. At the same time, we can observe a continuous shift from the design of the tangible world to the world of interactions, moving from interaction to experience and then from experience to services. Our economy and our society have moved from the secondary to the tertiary sector, and design has created conceptual and methodological answers to this fundamental change. Design is now about strategies and structures, processes and interactions – about services. 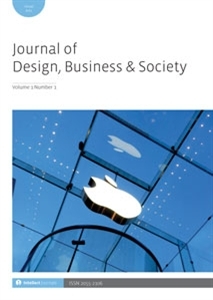 The Journal of Design, Business & Society is a scholarly peer reviewed journal that publishes high-quality academic papers, case studies, and critiques that examine the role of design in business or society, as well as book reviews of relevant literature. We aim to promote cross-disciplinary research, and therefore, in addition to soliciting design papers, we are also interested in receiving manuscripts on research about design that are coming from non-design areas, such as business, marketing, management, health, psychology, social sciences, environmental sciences, and so on. The journal is published twice a year by the international academic publisher – Intellect. The journal also commissions special issues with guest editors.